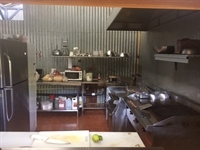 What's better than owning a restaurant in Costa Rica? Owning a restaurant with an ocean view. Our restaurant is well known and loved by locals and tourists alike. We serve classic American food, which appeals to expats living abroad who miss a taste of home, or people traveling who have had their fill of rice and beans. Established in 2014 our restaurant is one of the most popular in town, and consistently rated in the top ten "Restaurants in Tamarindo" on TripAdvisor. There currently is not a living accommodation that is finished at the restaurant. There is however a 400 sq ft unfinished space upstairs at the restaurant. It is currently used to store Surf Boards and our speaker system. This space could be converted to an on site owner's apartment. The main road into Tamarindo ends in cul-de-sac. We are located in the corner of that circle across the street from the beach. The business is a stand alone building with it's own private entrance. Behind the building is a large yard that is shaded by beautiful trees. This area is currently not used, but has endless potential for expanding the business. There are many opportunities for expansion. The large space behind the restaurant could be used to expand the available seating, and therefore increase sales. We currently offer bottle beer and liquor to our customers, but we are much more of a restaurant than a bar. We close nightly at 9 p.m. but there is a high demand for late night bar activities that we currently do not offer. Someone looking to take a successful business and expand it's offerings is our ideal buyer. 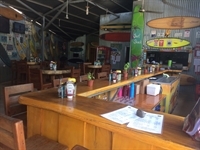 There are many restaurants to choose from in Tamarindo, but we have found our unique niche. We offer American Food at reasonable prices. We are popular with locals and tourists alike. Many of our customers are repeat customers, or referrals from other happy customers. We are looking for a new challenge. My husband and I enjoy building businesses and making them profitable. Friday-Wednesday 11 a.m. to 9 p.m.